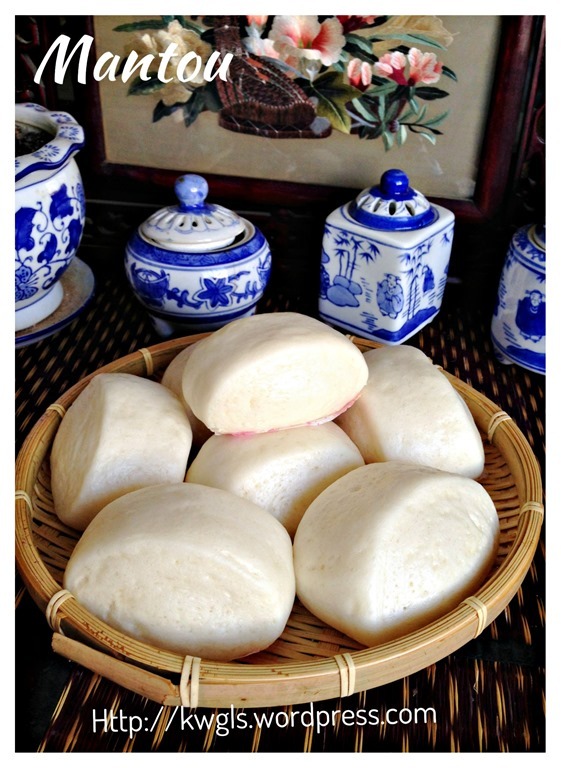 One of the readers was asking me if I have a recipe of mantou days ago and I told her no but I promised her that I will search for one recipe real soon. I do not have. 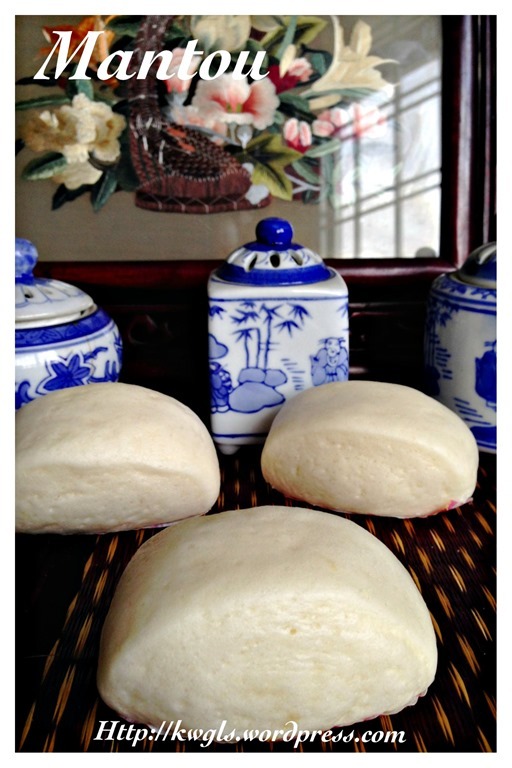 I have tried making mantou and failed rather miserably as it refuse to rise and the mantou is hard as stone.. 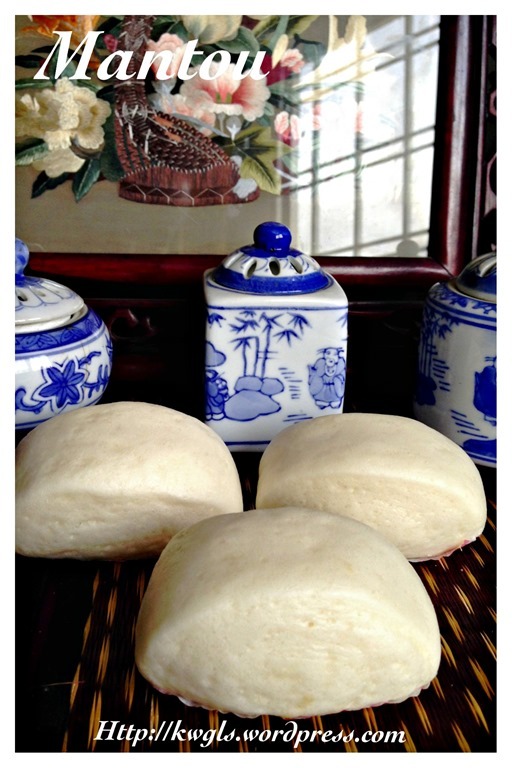 Since then, I have not prepare mantou.. Yesterday while I was searching for the mantou recipe, I am delighted to find this recipe in Mandarin which uses only single proofing. I am amazed by the look of her mantou. I told myself that I wanted to give a try. In fact I prepared 2 batches. 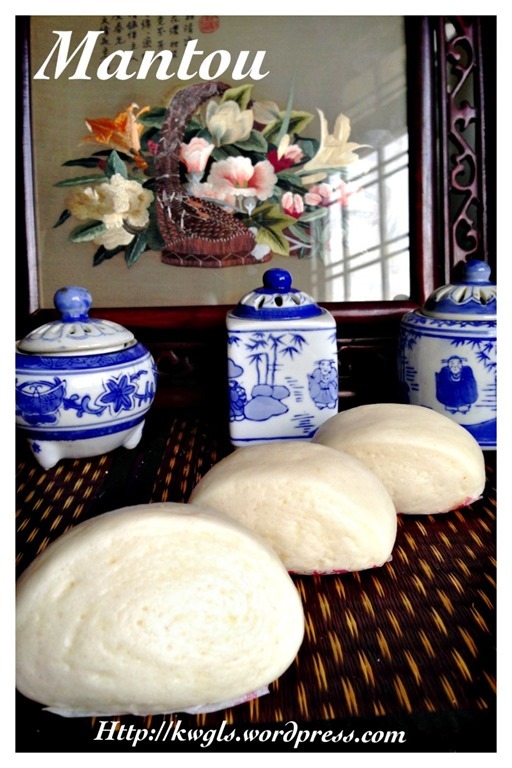 For the first batch, taste is satisfactory but the texture is fluffier than the normal mantou and it did not look like the mantou that I have seen. It is rather fluffy.. Definitely not over proof and I suspected it is because of the water content of the dough. I have this doubt is because the dough that I have appeared to be much softer than the dough that I seen in her illustration. After the photo shooting for the first batch, i have decided to prepare the second batch. Well. preparation is easy and it did not take long since it is single proofing . I have decided to reduce the water content and make it a “tougher” dough. Yes, I am happy with the results as it resembles the one that I have seen. I do not doubt the original recipe and I do know that for bread and dough related recipes, water absorption of flour used can varies significantly depending on the batches of wheat produced.. 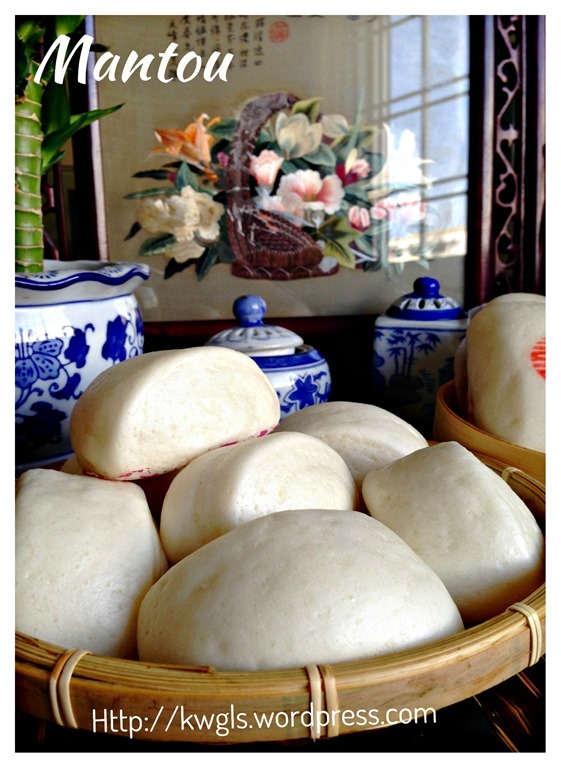 I love mantou for its simple taste and texture. 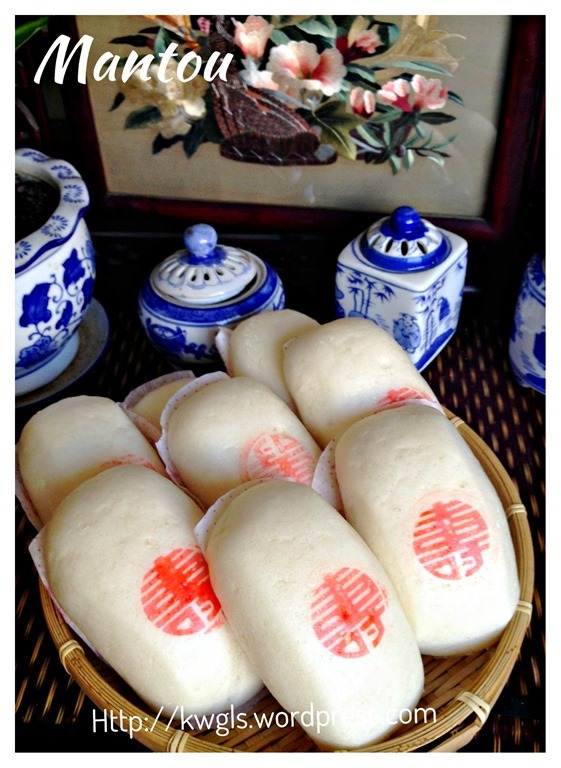 We used to buy the frozen mantou from the supermarket. It is definitely a very healthy breakfast item that goes well with a cup of soya bean milk. 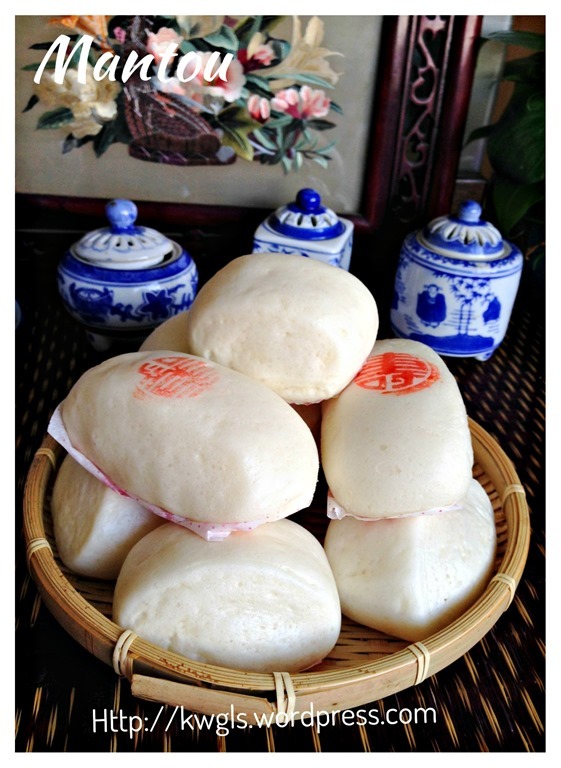 In fact, when I was stationed in China, it is common that we eat couscous porridge with some mantou. 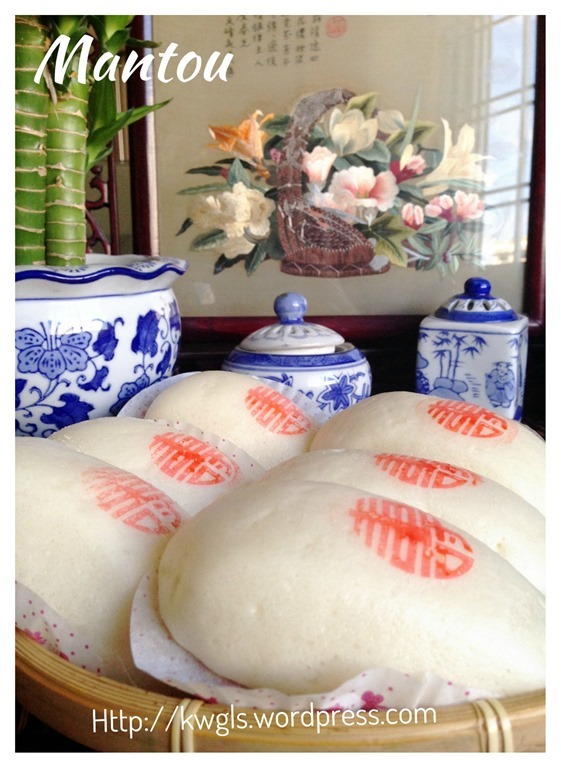 It can easily satisfy hunger and the fat content were almost nil in this Chinese steamed bread. Note that water ranges from 125 grams to 135 grams. 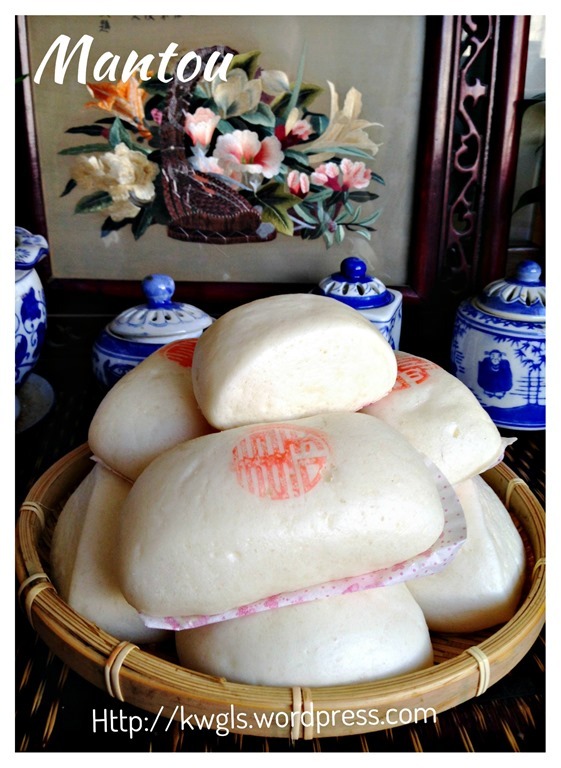 125 grams will yield a more compact mantou and 135 grams will yield a more fluffier mantou. Mix all ingredients and knead in a standing mixer until the dough leaves the sides of the whisking bowl. You can also manual do this until the dough is smooth and not sticky. 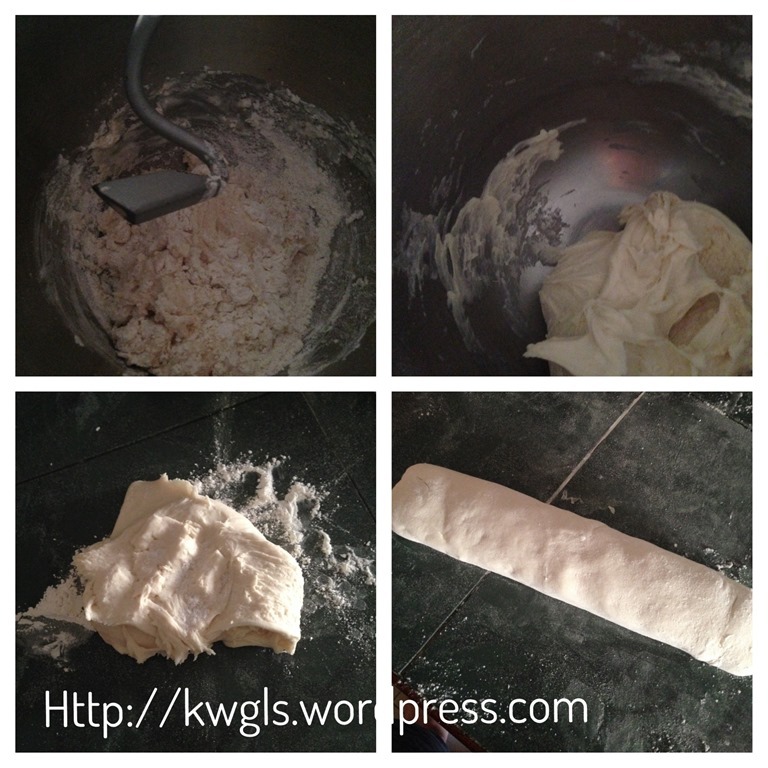 Shape the dough into a cylindrical shape of about 3-4cm diameter. Use a sharp knife to cut the dough into 8 equal pieces. Place in on top of a piece of paper or cupcake liner. Put in the steamer tray and let it proof until 1.5 times the size. When you lift the dough, you should feel that it is light. Once the dough reach 1.5 times of the size (about 30-45 minutes), transfer the steamer tray to the steamer with COLD WATER. Bring the water boil under high heat and steam for 15-20 minutes （note that the 15-20 minutes starts from cold water until the end of the steaming). 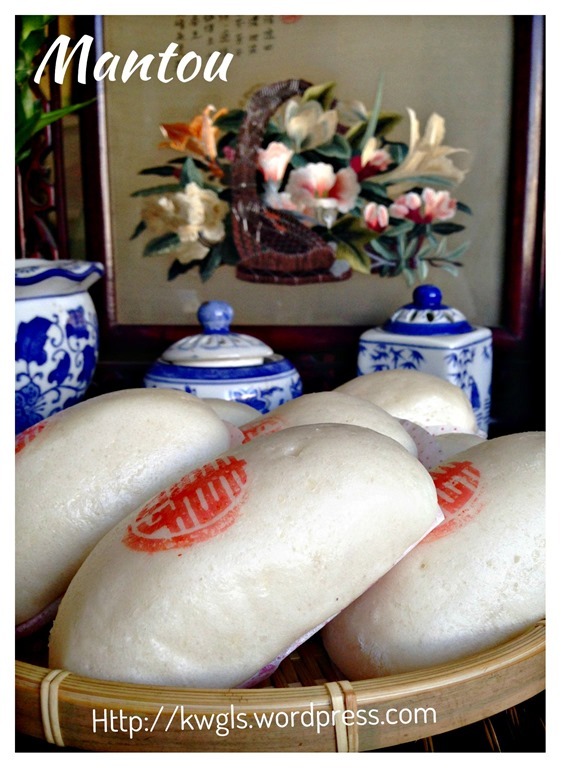 This entry was posted in Chinese and Asian Cakes and Snacks, Food Preparation Series and tagged chinese steamed bread, 美味刀切馒头, GUAI SHU SHU, Guaishushu, kenneth goh, postaday, 刀切馒头， 馒头，mantou. Bookmark the permalink. Hi….Thanks for your recipe…Luv them..Just wanna check with U….U mentioned gram in water….is it ml? For water density, gram and ml are the same. So it is either ml or gram. Thank for ur recipe:-) however, is the low protein flour = cake flour? I love working with yeast, and love trying new recipes. Let it proof in steamer without fire on? 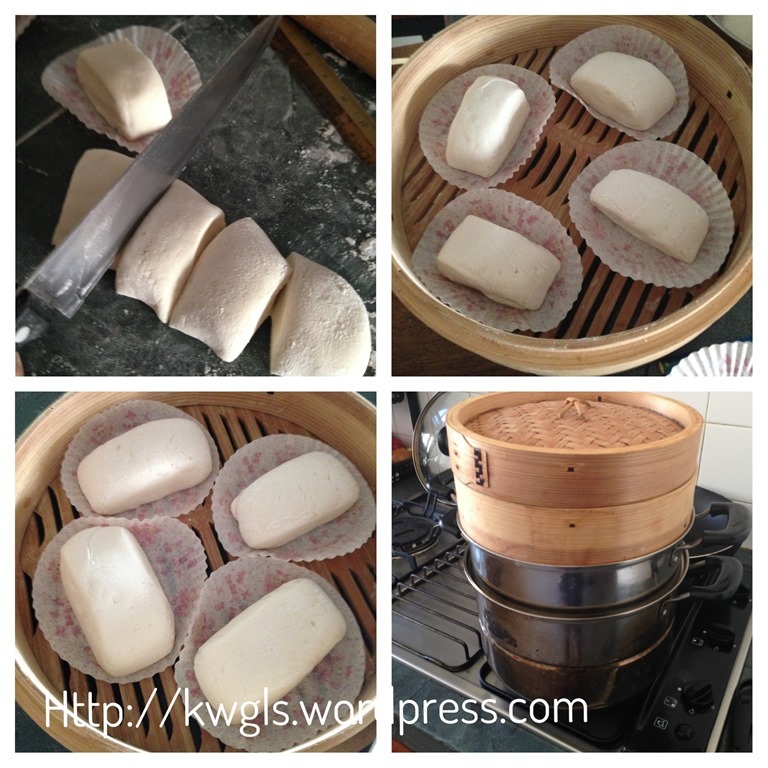 ok, i finally made mantou, i never thought it’s so easy to make. the taste is ok but healthy and less fat. really thank you. 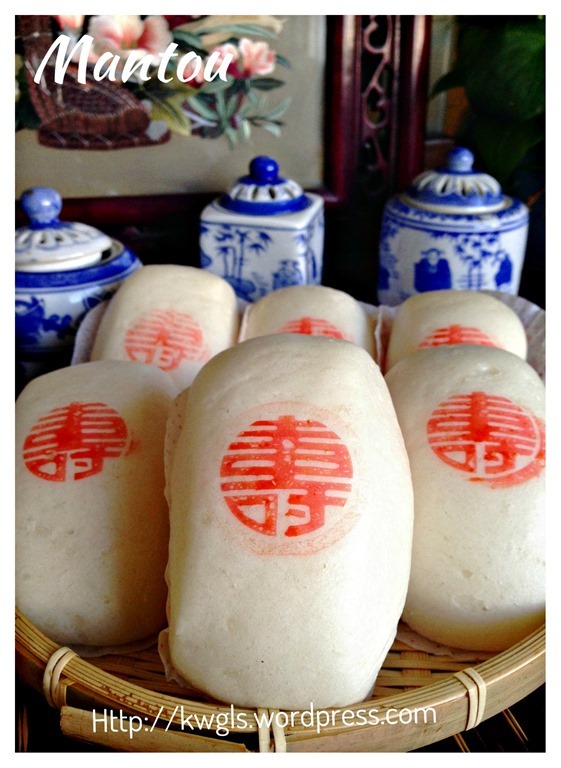 btw, can i store mantou in fridge for tomorrow breakfast? For kneading, do we need to reach the membrane stage? Or just smooth and non-sticky will do.? Excellent fast method. Man tou turned out fluffy even with normal wheat flour. Thanks for this recipe. I was just wondering if you can substitute yeast for something else. Will baking powder do? 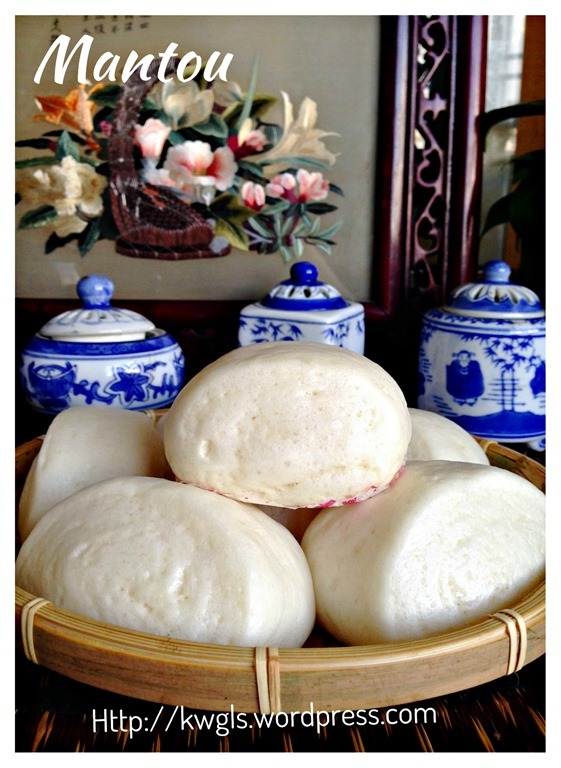 I really mantou and want to try your receipe. 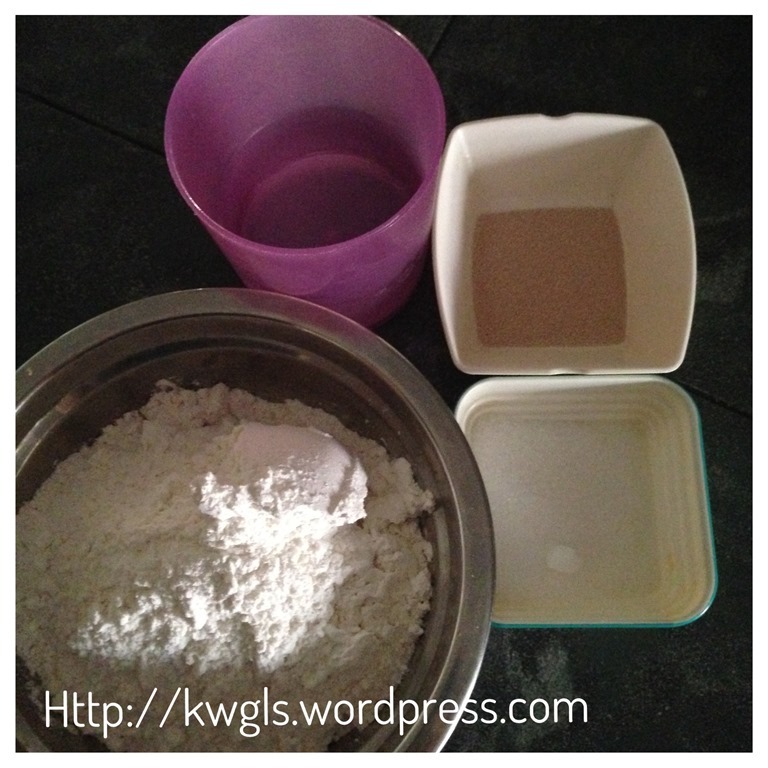 Can I use cake flour?,, Do I need to add shortening? if yes, how many. Thank you so much. Yes, you can use cake flour but it will be not as chewy. Can use vegetable oil to substitute but the colour will not be as beautiful. Home made will never be able to compare to store bought texture. Your proofing may need to reduce and in fact, I suspect no yeast is used and they purely leaven by some baking powder.. guess only.